Major thunderstorms. 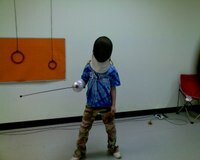 It's a fencing night and UO has offered to take The Littlelest Offering with him to a bike clinic, but that would leave Offering Boy enduring the Tornados of Doom all by himself, and he'd be cranky. So here I am with a decent Bordeaux and exotic cherry tomatoes for dinner. Dally, the Family Dog Emeritus and Kate, our Family Dog Adjunct, lie quietly in their separate hidey-holes. Dally hides behind the recliner in the rec room or under UO's desk; Kate, at the behest of her adoring public, reclineson a soft fuzzy blankie in her kennel. We love her, but we can only sustain so much puppy teeth love. I completely agree with UO about Atrios' post on the passing of Falwell. And Atrios is exactly right: imagine Jerry's surprise at the folks around him in Heaven. The perfect revenge comeuppance. The Bordeaux is soft, fruity, notes of currant and strawberries, well-balanced tannins and a smooth finish. Also under $10. It's French, a 60/40 Cabernet/Merlot split and it's got other blends/varietals/whatevers-but-not-imitators out there, so take a look. I needs must go help TLO pick out a pretty dress for tomorrow. Good night and don't forget to floss. Offering Boy turns 11 at the end of the month, when we will be in Williamsburg. So we had his birthday party here last night. He wanted a sleepover. Yesterday afternoon five of his friends came over with their sleeping bags and Game Boys; we ordered up lots of pizza; and UO and I physically restrained The Littlelest Offering to keep her from bugging the bejeezuz out of the boys. Of course, she was also needy and grumpy, and required a lot of attention and laps to sit on; and then we had a mother of all thunderstorms, which scared her to death because, since the Kansas storm, she knows that thunderstorms can beget tornadoes. So when she insisted that she sleep in our bed, we said yes. Which we picked out when I was pregnant with her, and chose because it was wide enough for the two of us and a baby. TLO is not a baby anymore. The wonderful boys were very wired and very loud. OB and two others made it through the night without sleep; two others crashed. The three of us, we happy few, slept on and off. Mostly off. At 4 a.m. the boys came upstairs and began to do loud things on the computer in the kids' room, so I said "someone needs to go in there and tell them to knock it off," at which point TLO swung her legs out of bed and said, "I'LL go." Anyway, the party was a success. Everyone went home happy, and OB had the birthday he wanted. It was a very non-Mother's Day Mother's Day. The boys left, UO went for a bike ride; OB (still wired on Diet Coke and AHDH) descended to the rec room to watch TV; TLO hunkered down in my room watching my tv; and I sat outside in the backyard with the dogs reading a really good mystery I'd picked up at CVS. Then it was time to go get ready for fencing. 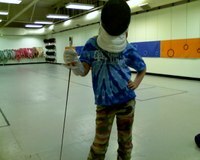 TLO says she wants to learn how to fence. I'm not so sure but I offer these images for your enjoyment. And this one, which I call "Hey, Sailor!" 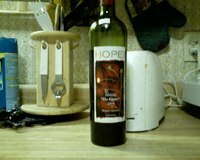 Topping it off, I discovered a lovely little wine shop, where I picked up a shiraz from Hope Vineyards in western Australia. $21/bottle, more expensive than I like, but yummy just the same.